Are you good with money? If so, you’ll know how satisfying it can be to decide what you want to achieve, plan how to get there and then sit back to watch your money grow. But for many of us, it can be almost as tough to stick to money goals as it is to carry through with our intentions to get to the gym more often, give up chocolate or go to bed earlier. making your goals too easy, which means they’re unlikely to make a real difference to your future. making your goals too hard, which tends to make people spend even more than if they’d never set goals in the first place. Try these tips to create worthwhile money goals you’ll actually keep to. The SMART system can help you clarify your ideas, focus your efforts and give you a clear path to success. For example, if you know you’ll need to replace your car within the next couple of years you might decide to set up a direct debit into a savings account every payday. Using the SMART system, you’ll have calculated exactly how much money you’ll need to save (Specific), how you’ll track your progress (Measurable), how you’ll cut your expenses to be able to make each payment (Achievable), what kind of car you’ll be able to buy with your savings (Realistic) and how long you’ll be saving for (Time-bound). 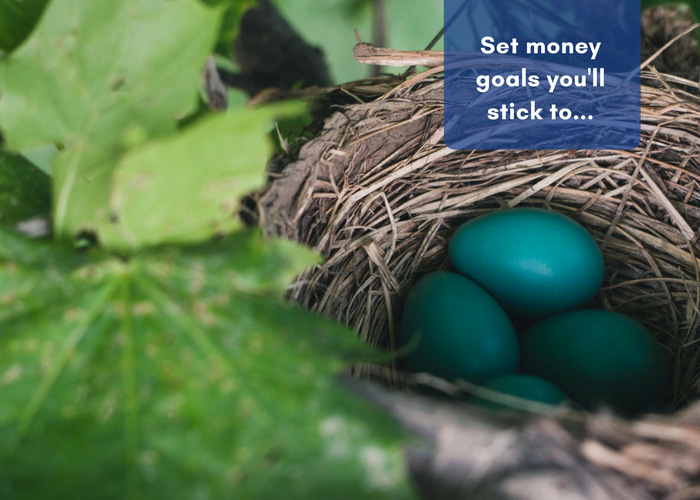 Not all goals have to be long-term – small changes can make a big difference to your financial future. Reviewing your KiwiSaver account to find out whether you’re in the right investment fund for your stage of life. KiwiSaver scheme providers may offer several different types of investment funds, ranging from more conservative lower risk funds to higher-risk growth funds. Setting up separate bank accounts for essential spending, non-essential spending and saving. Some people find separate accounts can be a useful way to help them avoid debt, live within their means and develop a savings habit. Making a regular date with your partner to set money goals and agree how to achieve them. As well as preventing money-related arguments, joining forces can help you to achieve your goals more quickly. If you’re looking to buy a home together, for example, you could both be entitled to make a first home withdrawal after three years of being in KiwiSaver. Taking some time to review what you’re spending on power, mobile phone, internet, insurance and credit cards. Could you get a better deal? Deciding whether any personal finance tools might help you stay on track with your goals. There are lots of choices out there, from budgeting tools like whostolemymoney.com to simple goal-setting apps like Productive. And don’t hold back from sharing your new money goals with close friends and family! Research shows that sharing your goals with others can help motivate you to succeed.